Kerala State Road Transport Corporation (Kerala KSRTC) Issued a Advertisement For Recruiting 11 General Manager, Chartered Accountants.All Eligible And Willing candidates Can Check Detailed Advertisement From Their Official Website And Apply Offline/Before 31-07-2017.Eligible & Interested Candidates Can Check Detailed Information For Each Postion Such As - Eligibility Criteria, Qualifications, Age Limit, Selection Procedure Before Applying. 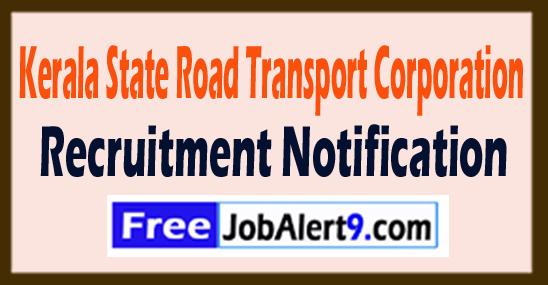 Kerala State Road Transport Corporation (Kerala RTC) Recruitment 2017 . Candidates Maximum Age Should Not Exceed 50 Years (for General Manager) 45 Years (for Other). Salary And Grade Pay Scale: INR Rs.1.5 lakh (Post 1), Rs. 1 lakh (Post 2), Rs. 75000/- (Post 3) . Candidates Must Pass BE, B.Tech Mechanical/ Automobile with MBA Finance Or Its Equivalent Qualification From A Recognized Board / University. Candidates Can Download Application Form through official website (http://www.keralartc.com). After Filling The Application form, Candidate must send hard by copies of Application along with relevant testimonials Mentioned In Detailed Advertisement to the following Address Before / (31-07-2017). The Secretary to Government,Transport Department,Room No. 394, Main Blocl,Government Secretariat,Thiruvananthapuram - 1. Click Here For Kerala RTC Recruitment 2017 Detailed Advertisement.